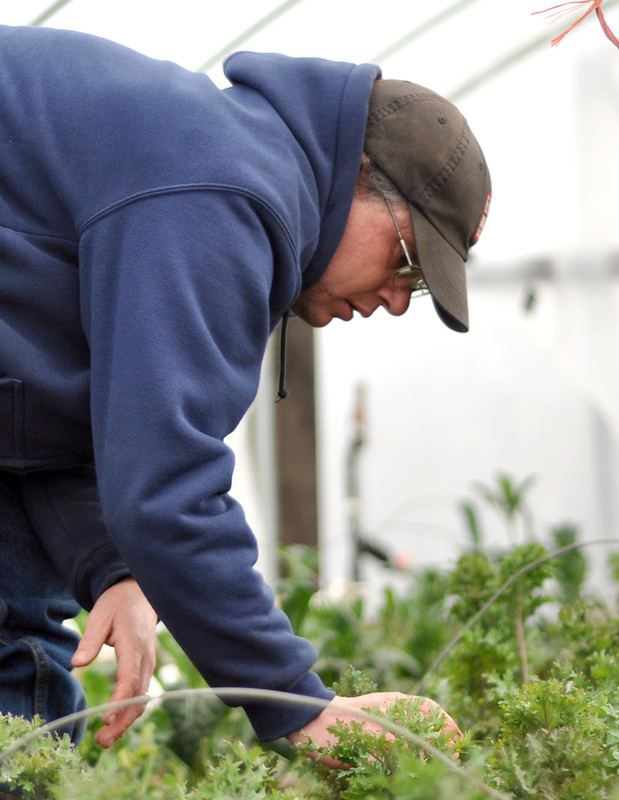 WSU organic farm manager Brad Jaeckel harvests a winter crop of kale Tuesday. • Farms sold an estimated $244.7 million worth of certified organic products in 2010, compared with sales of $144.3 million in 2006. Organic farmer Brad Jaeckel carries a razor-sharp, seven-inch blade and trowel with an exotically wicked name: the Hori-Hori. The Hori-Hori, “a pretty common tool,” is just one item in a toolbox for organic agriculture that’s always growing, said Jaeckel, Washington State University’s organic farm manager and instructor. Since the university broke ground on its organic farm in 2003, WSU has provided a place to put each of those tools to the test. Now, after nine years, the farm is getting an upgrade that could cost $15 million, depending on fundraising. As part of a campus master plan, the WSU Organic Farm will expand from approximately three acres to as many as 30. The new area will include a community center, a residence for students working at the farm, livestock ranges, an industrial teaching kitchen, alternative energy sources and more space for crops. WSU offered the first organic agriculture major in the country. The program now has almost 30 major students, said John Reganold, regents professor of soil science and agro-ecology. The organic farm provides a working laboratory for those students. Reganold said the money is coming from efforts by the WSU Foundation to find donors and sponsors. Construction on the new site, including roads, greenhouses and some croplands, could begin as early as this summer, said Laurie Mooney, a graduate student in landscape architecture who helped design the expansion. Mooney designed the master plan for the farm while working with Jaeckel each week. She also took a class with Jaeckel and works at the organic farm. The need for an expansion grew out of the popularity and support the farm has received over the years, Reganold said. He brought the idea of the farm to his department board in 2002 after hearing from students who wanted to take organic agriculture classes. With the help of graduate student Kathi Colen-Peck, he established the WSU Organic Farm and instructional practicum for organic agriculture a decade ago. Jaeckel, now 39, already had his own organic farm near Moscow. He took over at WSU as farm manager in the fall of 2004. The farm lost its operational grant money when Colen-Peck graduated, but Jaeckel had a plan to keep things running, Reganold said. The funding solution was a community supported agriculture system, as well as weekly income from a Wednesday farmers market in Pullman. A community supported agriculture system provides paying members with packed boxes of produce each week during the growing season. For the WSU Organic Farm, that season is from May through October and supports approximately 300 members per week. “Sometimes we don’t have enough membership spots for everyone at the height of demand,” Jaeckel said. With the finances of the farm in place and a dedicated leader in Jaeckel, more emphasis on education was a logical next step, Reganold said. Until the official growing season in May, Jaeckel works primarily in the hoop houses, which are half-cylinder plastic greenhouses built on metal frames. The radiating heat of the sun warms anything inside faster than the heat can escape, allowing Jaeckel to grow winter greens such as spinach and lettuce. He begins to grow vegetable transplants for the main season crops in the winter as well, in a greenhouse on campus. During the summer, the organic farm has approximately 80 crops to be maintained, including Italian plums, asparagus and even medicinal herbs. Students work alongside paid seasonal workers to do the planting, weeding and harvesting. Mooney was one of those students helping with the farmers market and the community supported agriculture system on Wednesdays.